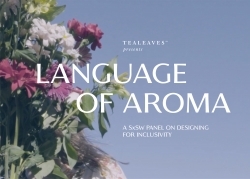 Austin, TX, February 25, 2019 — The luxury tea blender of choice for five-star hotels and Michelin chefs worldwide, TEALEAVES, to host The Language of Aroma: Designing for Inclusivity at the 2019 South by Southwest (SXSW) Conference and Festivals on March 10th, at the JW Marriott Salon 6 from 11am to 12pm CST. The company has partnered up with the female world leaders on design, curation and olfaction, including panelists from Microsoft, Cooper Hewitt, a Smithsonian Design Museum, and 12.29, the olfactory branding company, to showcase the importance of aroma on the human condition and discuss how principles of inclusive design can be used to bring further sensory accessibility to our world. “Aroma takes us to new heights. It gives depth and memory to experiences that would not be the same in its absence. Any great chef or wine maker would by far agree that aroma plays such a critical role in what they do – but how do you convey that level of excellence to someone with a temporary or permanent inability to smell? It was then that we realized that aroma could really be seen as an issue of inclusive design and embarked on an exploration of with the leading minds in culinary, technology, branding and accessibility to understand how to better share this added dimension with all,” says TEALEAVES CEO Lana Sutherland on the inception of the project. “This exploration is important in highlighting the ways aroma can positively impact society. It’s particularly interesting as we explore how to evolve the inclusive design practice at Microsoft in new directions embracing all senses. How might we apply inclusive principles to aroma? Just imagine the possibilities,” says Margaret Price, Principal Design Strategist at Microsoft. “Aroma has the ability to inspire or transport, ultimately enhancing the human experience. People have multiple senses working together at any given time. When one sense cannot be used, how can another? Our role as experience creators isn’t to 'fix' what someone is 'missing' but to fully leverage the way we interact with the world,” she adds. Margaret Price is an explorer of the relationship between culture, humanity, and, technology. She draws from marriage therapy, philosophy, biology, psychology to deconstruct how to embrace and sustain what makes us human in a digital age. At Microsoft, Margaret’s strategy and content is featured in the Inclusive Toolkit which was awarded by IXDA, nominated as a FastCO World Changing Idea., and was featured in the Smithsonian – Cooper Hewitt Design Museum. As an expert in design curriculum, and service design, her courses have been attended by over 12,000 at Microsoft and are taught in universities around the world. Most recently, within NYU, MIT, and, Brown. Ruth Starr is an educator committed to broadening Cooper Hewitt’s audiences and ensuring the museum is welcoming to all. Ruth works on accessibility efforts across the museum, including integrated education, exhibition, and digital initiatives which serve to improve how the museum engages visitors with disabilities. Through innovative exhibitions and experimental programming, the museum explores intersections across design and the human experience. Dawn Goldworm is an internationally recognized olfactive expert and the Nose behind successful fragrances for Lady Gaga, Nike, American Express, Valentino, Cadillac, and many more. Dawn’s expertise in perfumery is the result of years of training and her work at Avon’s global NY headquarters and Coty Beauty (NY and Paris), with a focus on the North American, European, Middle East, Eastern Europe, Asian and LATAM fragrance markets. Dawn’s rare abilities in synesthesia (blending her sense of sight, touch, sound, and smell), guide 12.29’s unique scent creation process, transforming branding into a complete sensory experience. This panel discussion is a part of South By Southwest 2019. Leading brands partner with 12.29 to transform communication and deepen brand loyalty through the visceral language of scent. 12.29 is the authority in olfactive branding for hospitality, fashion, retail, automotive and luxury residential brands around the world. Dawn Goldworm is the president and chief creative of 12.29. Dawn is an internationally recognized olfactive expert and the Nose behind successful scent identities for Nike, Valentino, Cadillac, Harrods and many more.